It’s Week 4 and time is short to get it completed. You can see Week 1, here and Week 2, here and Week 3, here. That has been a job, y’all. 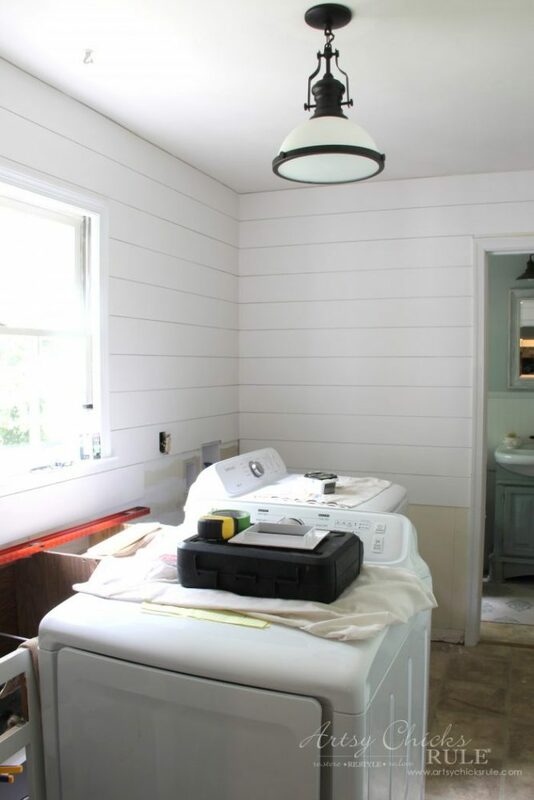 I don’t think I want to see a piece of shiplap again for a long time!! ha! 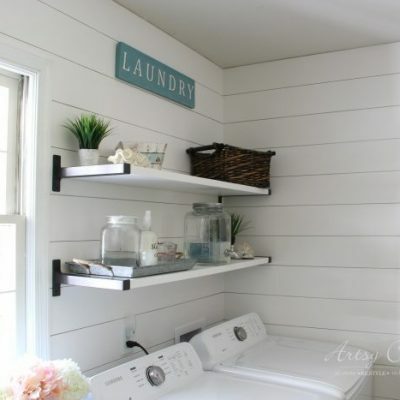 Except for those pretty white boards already up in my laundry room, of course. Anyway, let’s pick up where we left off on the farmhouse laundry last week…..
….this piece had a lot of cuts. And here it is in place…. 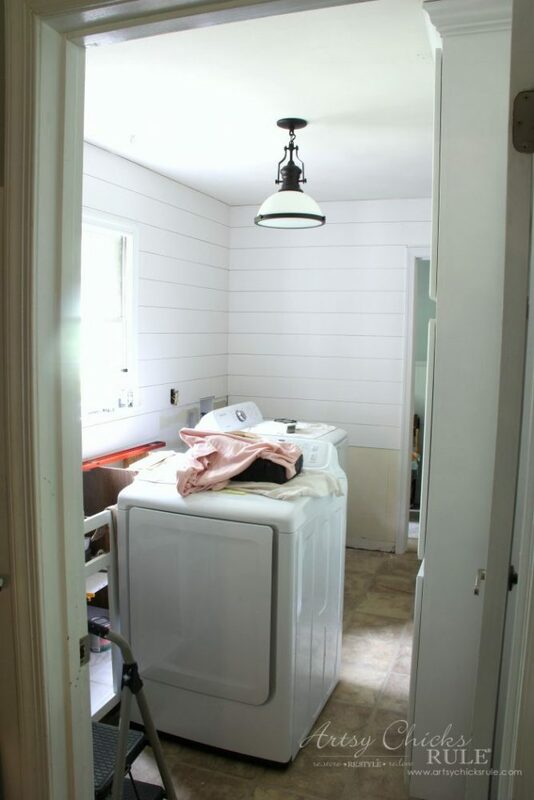 And here we are now…..
A few more pieces behind the washer/dryer and on the far wall. And then DONE! As always, I’ll try to include a few affiliate links to products I’ve used. See disclosure, here. And remember this necessary eyesore? Here’s what I decided to do with it….. In the end, I just didn’t want to mess with trying to cover it. We came up with several plans that would have worked okay but I’m totally happy with this. 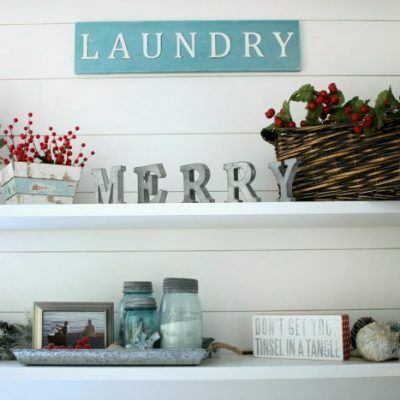 It is a laundry room, after all. That dandy little pipe thing on the wall is actually a curtain rod….and it was only $22! Until I put it up and actually hung something on it….. I never thought for a second about the depth of it when I found it. Anyway, let’s move on to this….. Remember this door from the earlier ORC posts? Since it’s a nice solid, heavy door we didn’t really want to replace it. So I thought I’d paint it white to blend in with the walls like I did with the electrical box. But just as I was getting ready to paint that first stroke, it hit me. Why not just stain it darker….prettier? I love contrast and the white would have just been too much in here. There is already plenty of white. I didn’t want it too dark so went with an Antique Walnut Get Stain. Love the gel stain, it’s so easy. I’m about half way down the door here…..
And here is a better shot to show the difference it makes…. 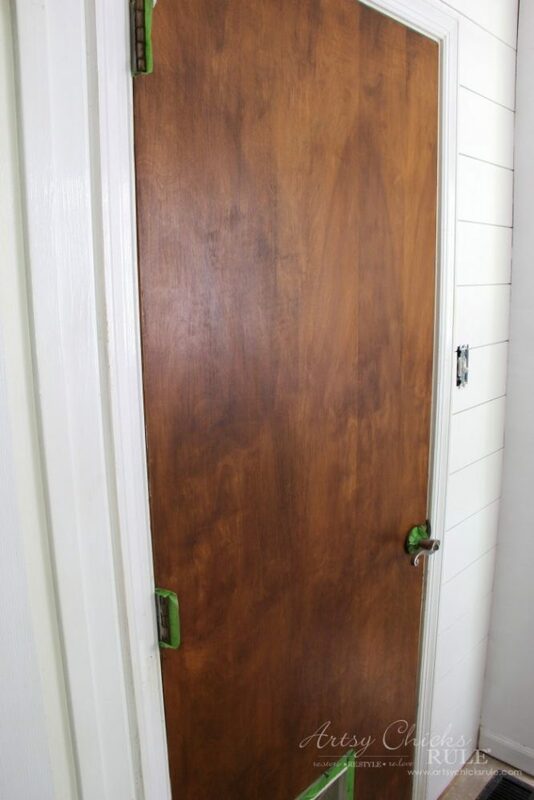 It really brought this old door to life! I’m so glad I thought to do this. I just love natural wood and am loving the contrast between it and all the white in here. And here it is, 2 coats….. 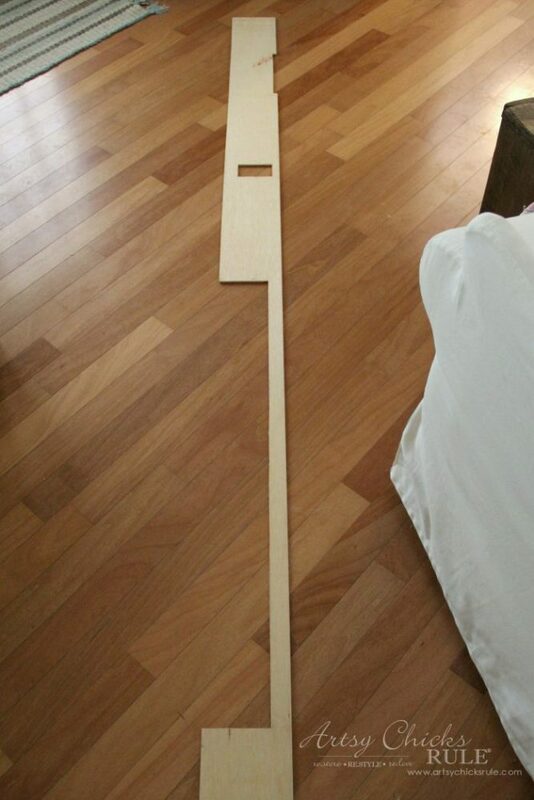 I still need to give it a coat or 2 of poly. I think I’m going to use this top coat. And one more…along with that pretty shiplap. We still need to put a small piece of trim there by the cabinet. And one last photo of our tight work space. We were going to move the washer/dryer out of the room but too much trouble really. I’ll be SO glad to get them back in place. Hopefully this weekend after we do the floors. The weather is calling for in the 90’s on Saturday here. That’s just crazy but I’ll take it over cold any day! 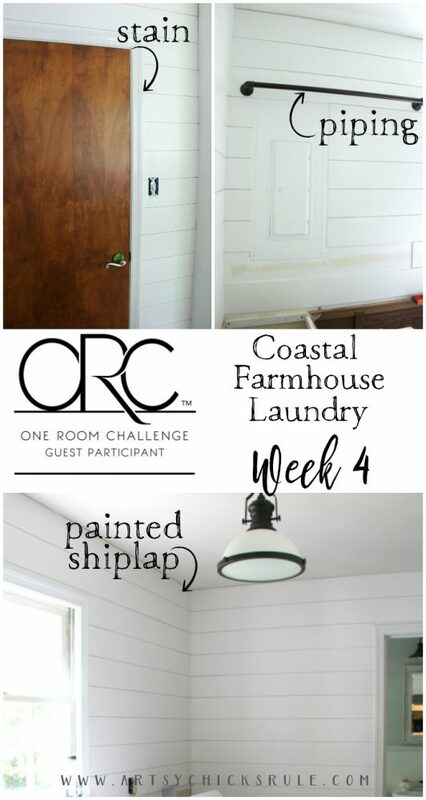 Don’t forget to hop over and see all the other One Room Challenges going on. 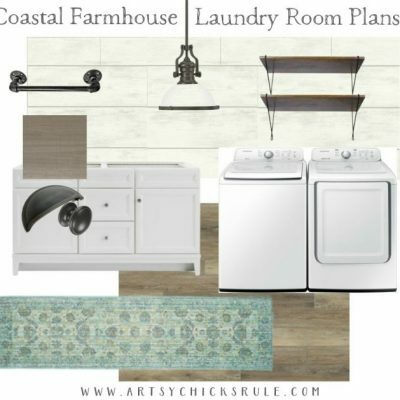 And PIN this coastal farmhouse laundry progress, week 4, for later! And the last progress report on Thursday before reveal day. Eek!! We have our work cut out for us. Week 4 You are here! 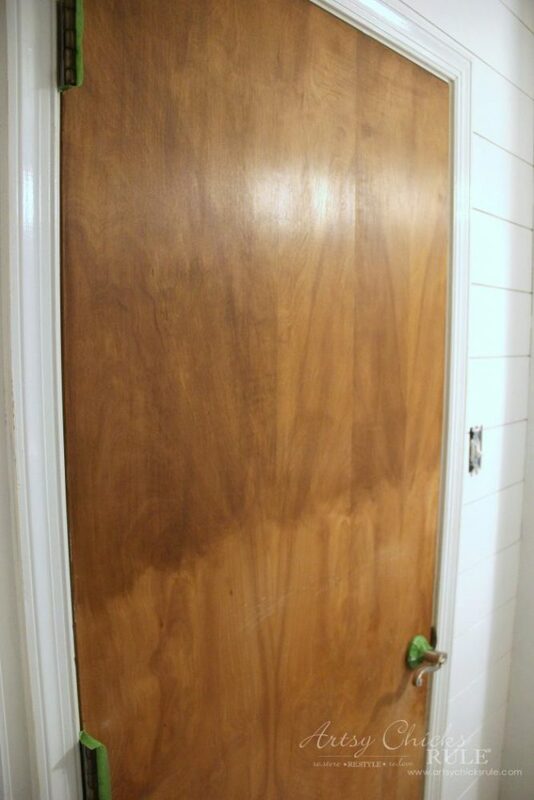 Your laundry room is really starting to look great, and I think that staining the door darker was a stroke of genius! Thanks Julie! :) I’m so glad it hit me before I started painting it!! 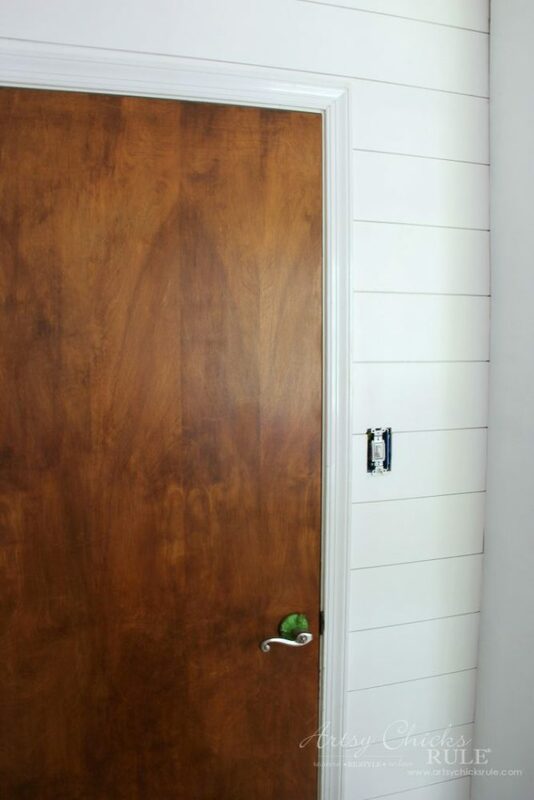 The room is coming together beautifully- love all of the shiplap and the door stain. Can’t wait to see your reveal in two weeks! OMG Your door is Gorgeous and makes for a very good contrast . Sometimes there is a such a thing as having too much white in a room, especially for a small room. Giving some sort of contrast like that makes the whole room. Very good choice. 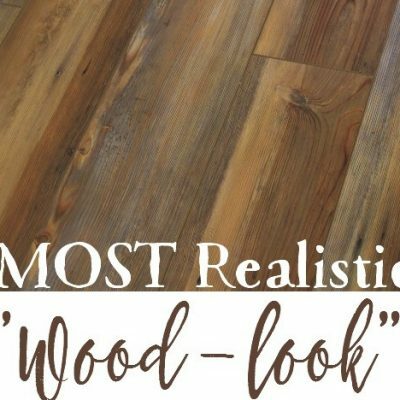 With your beautiful door; in my mind; I see a nice wood slat flooring. My fuse box is in my kitchen (ugh!). I found a beautiful picture with my colors at the local thrift shop for $6.00 (had the original price on the back – $65.00) and hung it over the box. It fits exactly, perfectly hiding that ugly thing. I love how creative you are and look forward to your postings. This room is going to be gorgeous! 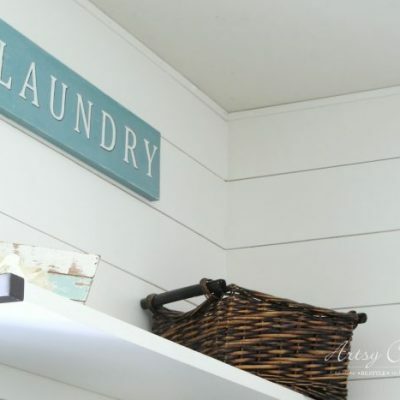 I’m considering doing something similar to my laundry room with the curtain rod! I love how the door turned out too. The stain color is perfect! Hi Nancy. I always love reading your blog and seeing your latest projects! Thanks so much posting them. I really love the direction you’ve taken with your ORC laundry room. 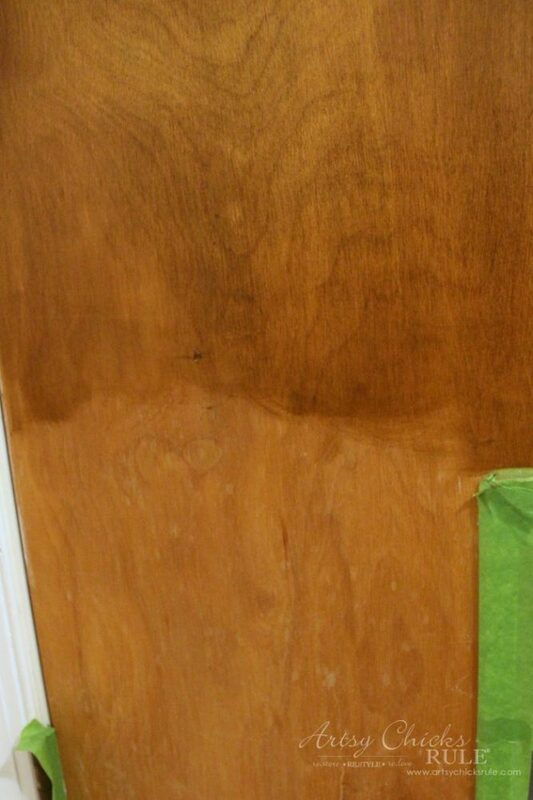 The stain on the wood door adds warmth. I think it would have been a little sterile if it were painted white. Looks amazing! I like both of your flooring samples, too. I think either would look great with your laundry room, so I would suggest whichever ties best with adjacent flooring. Can’t wait to see it finished! 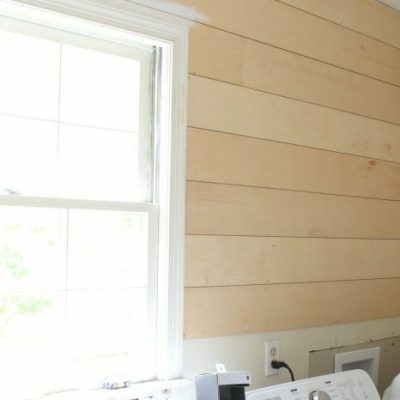 What a difference shiplap makes, it’s beautiful! I love that curtain rod too! Nancy, I am LOVING the shiplap! Its so worth all the hard work you guys put into it. 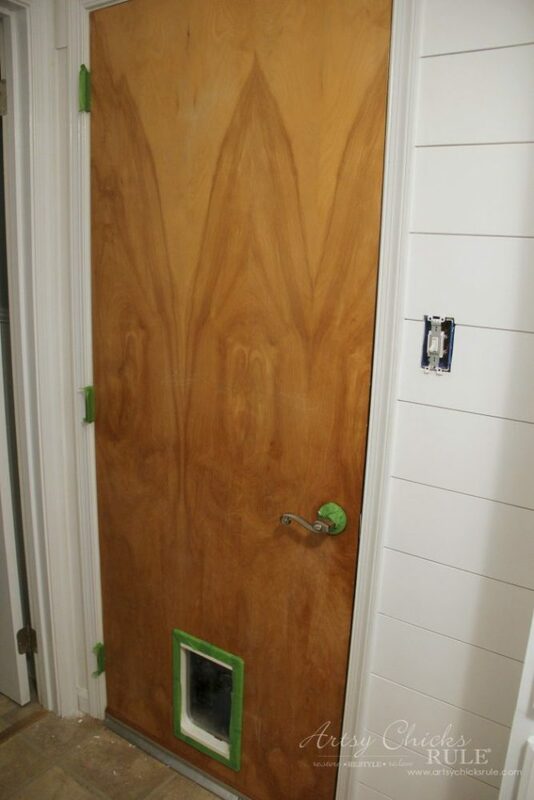 And I love that you chose to stain the door, great contrast against the white walls. Looking forward to seeing more! Love the door! 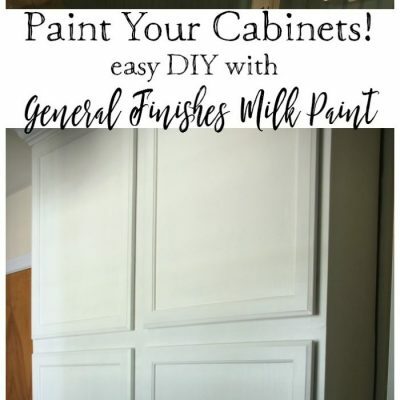 I’ve been trying to convince my sister to use gel stain on her kitchen cabinets. Maybe I’ll send her this post to convince her. Thanks so much! :) Yes, the gel stain makes it so easy. Darn, I guess I must be getting dense! I look at that picture of your solution to cover your fuse box, and cannot see the problem. 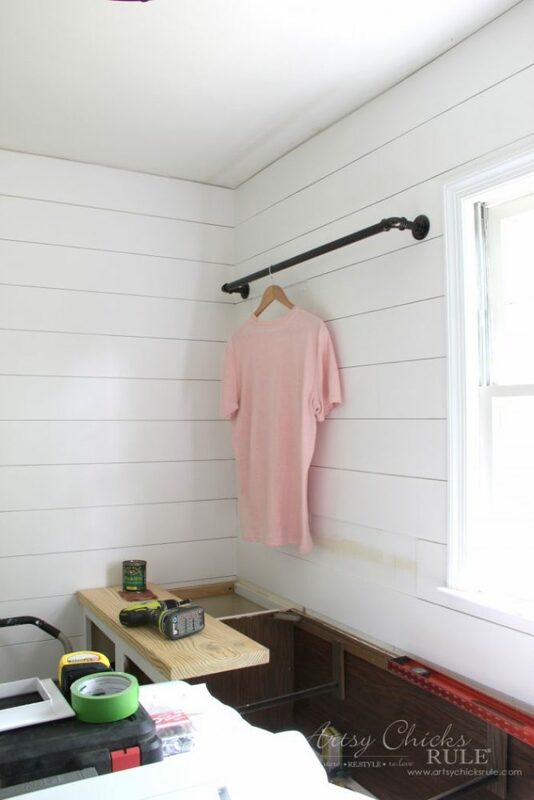 The box has disappeared, there is a cute little shirt bringing some needed accent color to the room, and that color and or pattern can easily be changed out, and the problem with it is……..?? If it is the depth, would a swivel top hanger solve the problem? I am really not enjoying getting old! 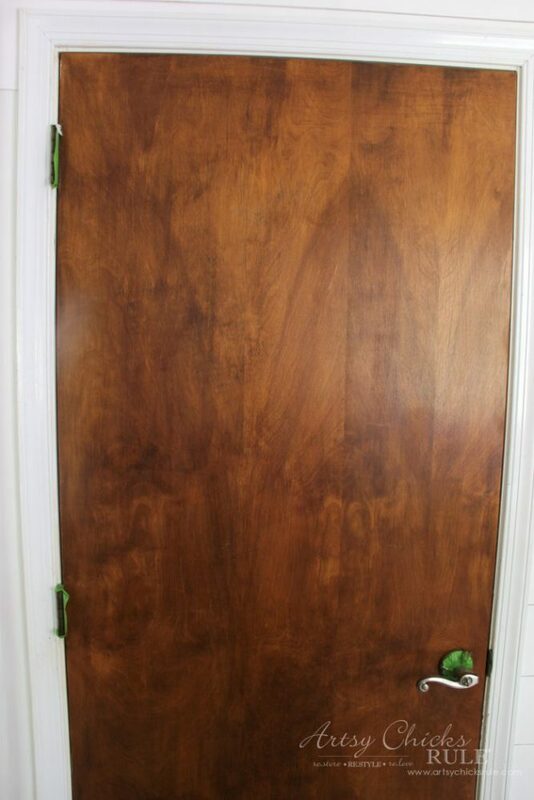 I LOVE the stained door! Brilliant idea you had! And I can’t wait to see what you have come up with to cover the breaker box. You are so creative! 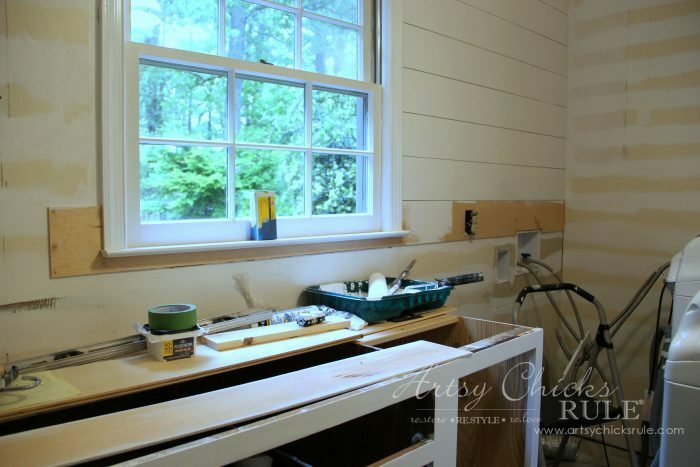 the shiplap looks great! it’s really coming along! A cute sign or piece of art would cover the electrical box. Just a thought. Everything looks great! Hang the rod from the ceiling instead!!! Hang the pipe from the ceiling. It will work great then. Hi Donna, I’ve decided to add another shelf on the side and hang it from that. :) I think! 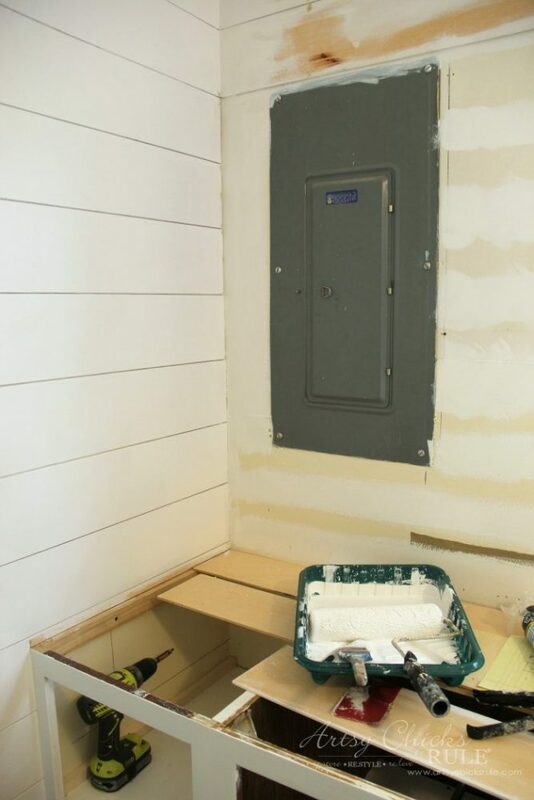 Only change I would recommend is not putting the shiplap over any of the exposed metal from the electrical panel. 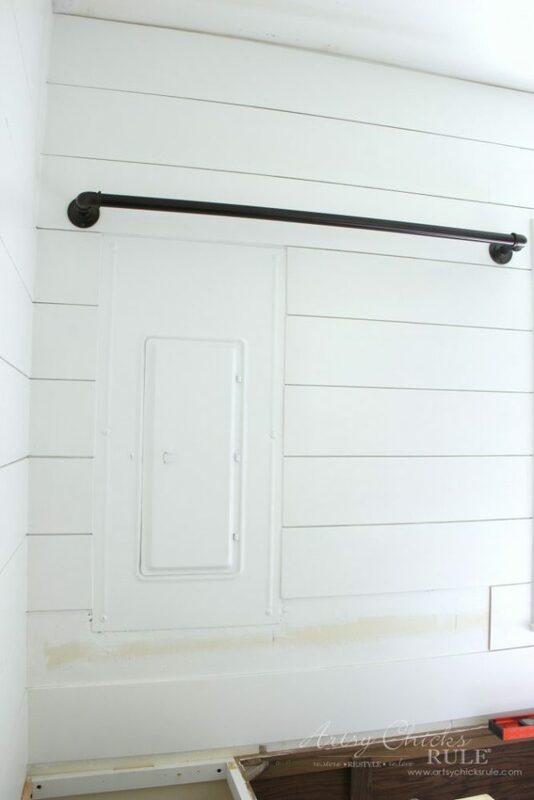 I noticed some of the pieces of your shiplap extended over the edges of the metal. If an electrician ever needs to pull that panel off, which they frequently do if a breaker goes bad, you’ll have a problem. Oh yes, we have already run into that! There were only a few boards that slightly overlapped so thankfully, it wasn’t too much of a big deal to remove the panel cover. Boards are all under now. A little paint touch-up and caulk and we are good to go again! :) And thank you! !